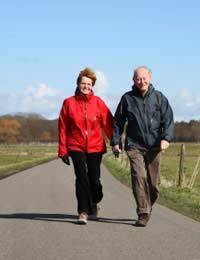 Walking can be very pleasurable and a chance to get away from it all and to enjoy the peace and the solitude that the countryside has to offer. However, there are occasions when your walks will take you along roads where there will be heavy traffic present. Alternatively, there are those who either walk for pleasure in areas where there is a lot of traffic simply because it’s more convenient or there are no public footpaths close by. In these situations, you need to take extra care to stay safe. You should always keep to the pavements where possible but you still need to be aware of what’s around you as many cyclists choose to ride on the pavements (illegally) themselves. Where there are no pavements, however, you should always walk on the side of the road on which the traffic is coming towards you. The only exception to this is where you may be coming up to a blind spot when you should cross over to the other side to avoid being hit by any vehicle which may be coming around the bend. Allow for a good 40 or 50 yards before a blind spot and cross over to the other side at that point. Be careful when standing on or near to corners, bends or intersections of road junctions. This is particularly important as vehicles like buses, larger trucks and any wide load bearing vehicles will often have to make a wide turn which sometimes means that their rear wheels will actually ride up onto the pavement. On the subject of trucks and other large vehicles, never be found standing behind a large vehicle which is reversing as there’s a strong likelihood that the driver will not be able to see you in their rear view mirror. As a pedestrian, you’ll probably be even more aware of the dangers of crossing the road as the drivers are that are using it so you need to always expect the unexpected and don’t assume anything. Two of the most dangerous situations involve pelican crossings and also the use of indicators. With a pelican crossing, you should always ensure that the traffic has come to a complete halt and that the signal to walk is on green before crossing. A fatal error is to see one car slowing down on, say, a dual carriageway, as the light has gone to amber yet another driver in the outside lane may decide to chance gambling on amber and put their foot down on the accelerator. Also never assume that a driver will always remember to use their indicators. A prime example of this is at a roundabout where a driver looks as though they’re going to travel on to the next intersection but then they suddenly veer off and head towards where you’re trying to cross having failed to indicate. So, remember that no indication does not necessarily mean a driver isn’t going to turn. In general, don’t assume! Make sure you’re visible to drivers. In the winter months and, at night, in particular, wearing fluorescent clothing or attaching some kind of fluorescent strips to your clothing will help you to be seen by drivers far more easily. Some people will even wear a head torch or carry a torch with them when walking at night. Admittedly, many people like to walk whilst listening to a personal stereo player. Whilst this is not forbidden, it is important to point out that your safety is likely to be compromised somewhat by the fact that you can’t use your hearing to gauge the distance of approaching traffic so whilst not saying that you shouldn’t listen to music whilst you walk, it is worth noting that your hearing does play a significant role in your safety as a pedestrian. Perhaps, this is more important at night when you might appear less visible and perhaps, might be slightly less vigilant when there is less traffic on the roads. Another potential problem with walking at night whilst listening to music is, although not meant to cause alarm, it does mean you are also vulnerable to the likes of would be muggers or attackers who can visibly see you could be an easier target.